This X-Pipe is smog legal and eliminates the AFM valves from the system. It does not fit convertible models. 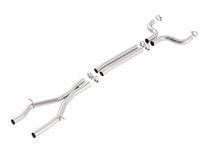 These Mid Pipes are not intended for use with OE factory mufflers. 2016-2019 Camaro SS 6.2L V8, Automatic/ Manual Trans Rear Wheel Drive 2 door, except convertibles.